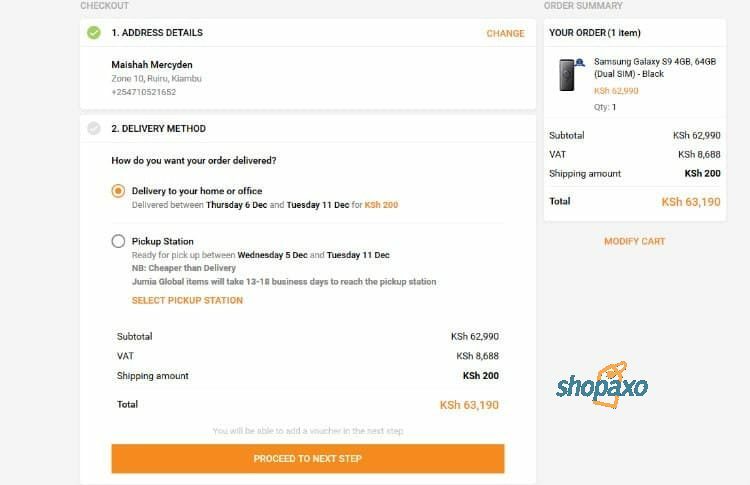 I have taken time to write this complete guide on how to place an order on Jumia Kenya so that I can answer most of your questions. However, before we can go deeper into this, it is important for you to note that you can place your order from any location in Kenya and have your package shipped and delivered to your doorstep. Before you can place your order, you need first to open an account with Jumia. If you have your account ready, then well and good let us proceed. If not, I would recommend that you read this article before proceeding. And the beauty of the article is that you do not have to come back here, just proceed with that page to place your first order! Check that nobody else is logged in. This is very important if you are using a public computer. If you are using your mobile phone, which is the likely option, go to google play store and download the Jumia Kenya app. Thereafter, whether you are using a desktop computer or laptop or your phone, the procedures are same henceforth. At the Jumia Kenya’s homepage login with your credentials. You can find the login option under Account tab at the top left. 2. Search for your desired product. Once logged in, you need to search for a product you want to order. However, before you can proceed with how to place an order on Jumia Kenya, you will notice that your name (the one you used during registration) shows up. Once here, you can search for the item you looking for. You do this by entering you keyword in the search box. Alternatively browse through the categories. Once you have your desired item, click buy. However, before you do so, go through the product specifications, read through the description, read reviews from other buyers and finally look at the seller score. (Jumia Kenya could have other sellers selling the same item. Read this guide if you do not understand this). If everything looks fine, hit the buy button. But wait, a close at the page reveals that there is a discount code if you buying using the Jumia Kenya app. Copy the code for use later if you are using the mobile app. Now hit the buy button. After you hit the buy button, a pop up message will come up which will ask either you to either proceed with shopping or view cart and proceed to checkout. Hit the view cart and proceed to checkout button. After hitting the proceed to checkout button, you will be taken to a page that looks this way. Step 1 involves confirming your shipping address. During registration, you provided this information, so no need to worry. Only note that if you wish to change your shipping address, you can do it here. Step 2 will require you to choose your delivery method. Here choose accordingly, where you want your package delivered. This is either at your home or office or whether to pick it up at a pickup station. Step 3 if you hit next step button under step 2 you will be taken to a page that looks this way. This is the payment option. Choose whether you are going to pay via Mpesa or you will pay cash on delivery. Sometimes the pay cash on delivery is not available. This is true especially where large amounts of money is involved. Now here is where you enter the discount voucher that was provided earlier. If you have one, enter it in space provided. See the diagram in step 5 above. 7. Relax and wait for your package. After hitting your confirm order button, you can relax and wait for your package. However, you need to check your mail to see whether it has been confirmed. This may take several hours. Once confirmed, you can track your order in real time under your account tab. You will receive an sms message on the day of delivery, then a few hours later you will receive a call to arrange on how to receive your package. If you have come this far, congratulations, you have just made your first order! You have learned how to place an order on Jumia Kenya! Even after learning how to place an order on Jumia Kenya, there could be a few questions that may not be answered yet. I have listed below some of the common questions and their answers. What are the delivery charges of my item? This depends with two things. One the shipping distance and two the bulkiness of the item you are ordering. 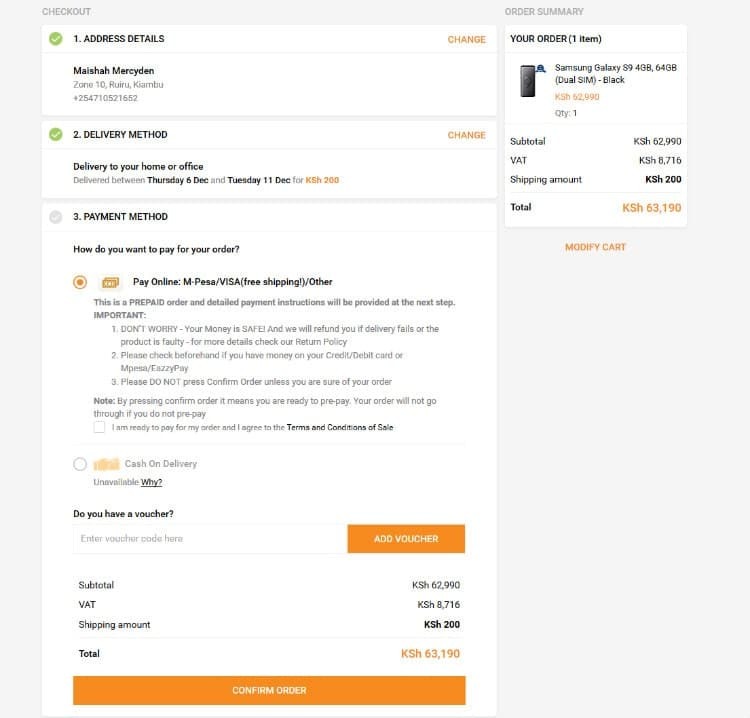 You can be able to see the shipping cost as you proceed to checkout. What if I do not want to incur shipping cost? You can pick your package at a pick up station near you at a cost that is less than the shipping cost. Find out a pick up station near you, you can use. The other option you have is to pick your package at the Jumia offices if they are near you. Pro Tip: From my shopping experiences on Jumia, it costs even more in bus fare and time wasted if you opt to pick your package at a pick up station or Jumia Kenya offices near you. I prefer having it delivered to me. Can I open the package before paying? This may not be necessary. In my 4 years of shopping on Jumia Kenya, I have never received a wrong item. What am I saying? It is extremely rare to receive the wrong package. But should it happen, you can have it returned and replaced. Read Jumia’s return policy. Yes, you can, either by Mpesa or by cash. However, the cash option may not be available if large sums of money are involved. I see no shipping address, what should I do? If you see no shipping address during checkout, it is likely that you gave that information during signing up. Go to your account and see it there. If you are a new customer, you will need to add your shipping address. The landmark in the shipping address is not recognized, what should I do? Always use a well known landmark. This could a school, a supper market, a petrol station, a church or mosque or a building. How long should I wait for the package to be delivered? This again depends. If you live in Nairobi and its environs, the shipping speed will be fast than for people living upcountry. Can go directly and pick my order at Jumia offices? Yes you can, however Jumia discourages this to de-congest their offices. What items are on sale on Jumia? There so many items from so many categories you can choose from. Just explore the categories to discover. Jumia is a trust worthy site shipping millions of products every day. There are over 16 million subscribers on Jumia Kenya. 16 million people cannot be wrong. If you decide to make an order on Jumia Kenya, do it in confidence. Learning how to place an order on Jumia Kenya is that quick. Within a few minutes, you should have made your first order. Should you have more questions about this topic, feel free to ask. You can do so in comments box below or by going to contact me page. Next articleOnline shopping in Kenya in 2019: 5 mistakes you are making right now.